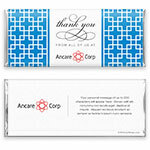 Your corporate logo can be easily incorporated on either the front or back (or both) of this contemporary chocolate bar wrapper design. 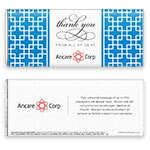 Design: Geometric squares pattern with central message space. 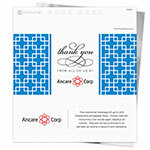 Personalization: Front message with logo, back logo space and message.